Alexa, "Open March Madness"! Play the Accessible Bracket Game, and Get All Your March Madness Information! If you’re anything like me, you find yourself caught up in the phenomenon aptly termed “March Madness.” Even the most casual college basketball fan can find something to interest them as it relates to March Madness—a local school who succeeds in the tournament, a small school who defeats bigger schools and advances, or the inspirational story of a player who has overcome adversity to make an impact on the tournament. Regardless of your level of tournament knowledge or interest, we provide you links for participating in an accessible bracket contest and for listening to or watching the games. If you have tried to play bracket contests in the past, you are keenly aware that many of them lack accessibility. 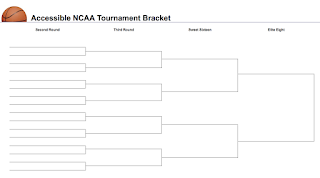 There are too many available contests to test for accessibility, and interfaces change seemingly from year to year; however, we know that there is one specially created bracket contest, the goal of which is to provide a fully accessible bracket for screen readers. 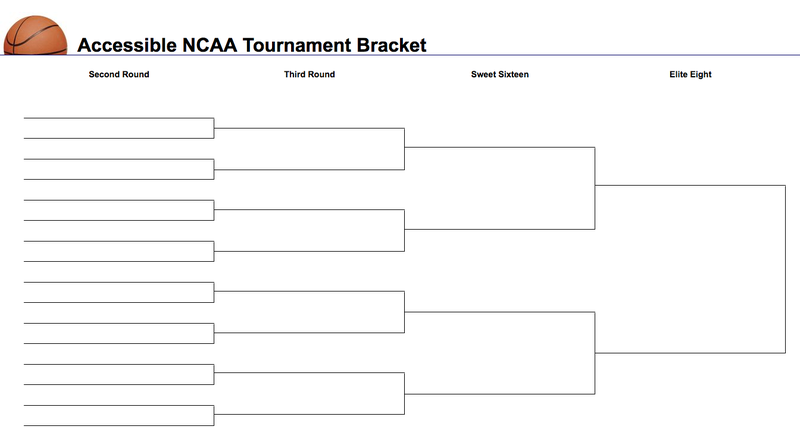 To participate, go to http://terrillthompson.com/ncaa/ to get all of the information and to fill out a bracket. Understand that going to the link shows you the bracket; you must click on the “pool” link to sign up, play the game, and create a potentially winning bracket. Also on this site are links for schedules, scores and live broadcasts from Westwood One Radio. Terrill Thompson, who sets up this bracket, also runs an accessible sports list which you can subscribe to by filling out the form at http://mail.terrillthompson.com/mailman/listinfo/accessible-sports_terrillthompson.com. Note that once you fill out the form, you must wait for moderator approval before you are subscribed. If you want just radio broadcasts, the best site is www.westwoodonesports.com which will allow you to listen to every game including the First Four. You may also be able to replay games you missed, and game highlights and recaps certainly are available. Westwood One offers five channels; one is the national Westwood One broadcast which highlights one particular game and moves back and forth among the remaining action. If you listen on a “regular” radio and not using SiriusXM or the TuneIn app, you will hear this channel. If the game you care about most is not featured, you can hear it on the Westwood One site for free on one of the other four channels, one for each tournament region, or you can listen on SiriusXM Satellite Radio if you are a subscriber. Finally, if you wish to listen to the games on your Smartphone, of course, you can use the SiriusXM app if you are a subscriber; however, the app that works best and usually is accessible enough, even if it is a bit confusing at first glance, is the TuneIn radio app. The quickest way to locate it is to search for TuneIn on your app store of choice; however, for more information, go to https://tunein.com/get-tunein/ to read more information or download the app. Please note that TuneIn has a free version, a paid version that removes ads, and a premium version which offers a monthly subscription for listening to audio books, NFL and MLB broadcasts. You may select any of these options based on your particular taste, but please note that the free version is all that is necessary to listen to the NCAA tournament games. The aforementioned site provides much greater detail about all of the options for viewing and listening to the games; check out http://www.ncaa.com/news/basketball-men/article/2017-03-07/ncaar-march-madnessr-livetm-provide-fans-live-streaming-2017?cid=ncaammsocial_tw_sf60693693 and enjoy the Madness!